Launched in 2013, SOLANDGE was built at the Lurssen shipyard under the supervision of the Moran Yacht & Ship new construction team. 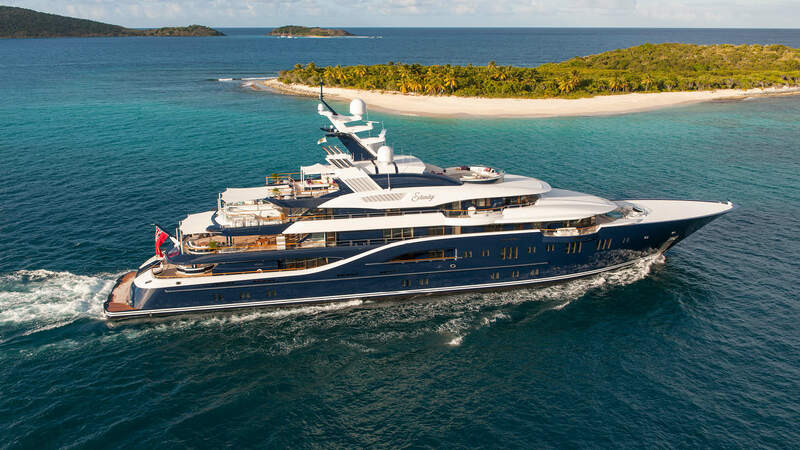 She measures in at 279′ (85.1m) and has an Espen Oeino exterior design which is characterized by sweeping forms, curves and lines and a gorgeous interior by Aileen Rodriguez. SOLANDGE has a steel hull and an aluminum superstructure, as is usual for most boats of this size and type. The yacht also has magnificent interior communal entertainment spaces and expansive exterior areas, so she is very well suited as a luxury charter yacht as well as a private yacht. The yacht can accommodate up to 12 guests in 8 magnificent cabins. She also has a large individualized owners’ deck and suite. The vessel’s numerous crew of 29 sleep in 15 crew cabins. SOLANDGE features very large tender garage doors which are located to aft on her lower deck. She also has another doorway which could be used as a tender docking area in her hull and also as a beach swim platform.